A few months ago I read the novel Do Androids Dream of Electric Sheep? for English class. Sheep were only mentioned a few times. I was pretty disappointed because I was really looking forward to reading about electric sheep. Goats came up quite often though. I ended up writing an essay on why the author chose goat ownership as a symbol for wealth. I really enjoyed the novel, and decided that acting like a character in the book for a few days would make for an interesting social experiment. I, of course, chose the goat. I was not very familiar with what I dubbed as ‘goat noises’, so I made sheep noises. Everywhere I went, I baaaaed. I walked up to people and bleated at them. I also incorporated the noise into puns, making sure to wish everyone goodbaaaahy after a goat conversation. Eventually, other people joined in and would bleat with me. First was A. She was reading the same novel for class and quickly picked up on what I was doing. Or at least she went along with it. We bleated at each other from across the hallway. We also bleated at each other as a greeting. Needless to say the conversation was awkward, but I enjoy awkward conversations. They are far more exciting than regular ones. I cannot participate in normal conversations. The other day someone asked me how I was, and I replied with “nothing much”. Eventually, my English teacher joined in and bleated with A and me. No one gives me strange looks anymore when I bleat at people. I think they are used to it. Perhaps bleating has become “cool”. In honour of my love for goats (how could you not love those horns? ), I whipped up a batch of goat cheese ice cream this weekend. I chose to overlook the likely uncomfortable process for the goat. I also roasted some cherries and threw them in (very carefully, however, as to avoid purple streaks in the ice cream). I was not really sure how I expected this ice cream to taste, and it is indeed difficult to describe. The tang of the goat cheese nicely complimented the sweetness of the cherries. The cherries were chewy, not icy. My parents compared the ice cream to a cherry cheesecake, but that description does not adequately describe the complex flavours in this deceivingly simple combination. This ice cream is perfectly creamy and will melt into rivers of tang on your tongue. 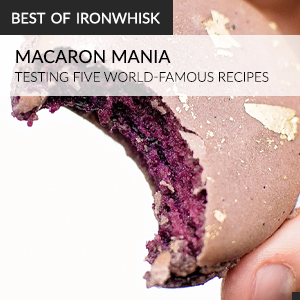 Plus, the flavour combination is bound to impress your dinner guests. 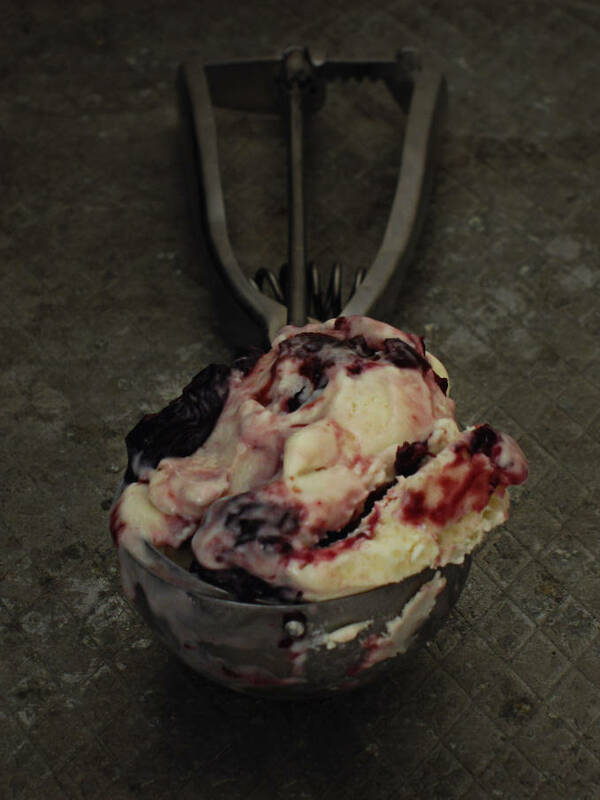 Tangy goat cheese ice cream with chunks of roasted cherries. Recipe very slightly adapted (to reduce sweetness) from Jeni’s Splendid Ice Creams at Home. In a small bowl, mix 2 tablespoons of the milk with the cornstarch to make a slurry. In a separate medium bowl, whisk the goat cheese, cream cheese and salt until smooth. Using a large saucepan, combine the remaining milk, the cream, sugar, and corn syrup over medium-high heat. Bring the mixture to a rolling boil, and boil for exactly 4 minutes. (The mixture will rise as it boils, so keep an eye on it!) Remove from the heat. Make sure your cornstarch slurry is still well mixed. Slowly drizzle the slurry into your hot milk mixture while whisking vigorously. (Otherwise, the slurry will form a film on the bottom of the pan.) Bring the mixture back to a boil over medium-high heat, and cook, stirring vigorously, until slightly thickened, about 1 minute. Remove from the heat. Gradually whisk the hot milk mixture into the cream cheese mixture until smooth. Pour into a container and refrigerate until completely cool, at least four hours. Mix all ingredients together and bake at 400°F for thirty minutes, stirring halfway through. Cool completely and place in the refrigerator until cold. Pour the ice cream base into your ice cream maker, and process according to the manufacturer’s directions. Transfer the ice cream into a storage container, alternating it with layers of the roasted cherries. Do not mix. Press a sheet of parchment paper directly on the surface of the ice cream, and cover with an airtight lid. Freeze until firm, at least four hours. I love goat cheese and cherries, and I often use goat cheese in place of heavy cream (or together) – as a mousse: I have a couple of recipes on my site. I am sure this ice-cream is absolutely delicious: most people don’t realize how good goat cheese is in desserts! Ilan this sounds wonderful. I will certainly try this one. So now just how long will you be speaking in goat? Goat Cheese and roasted Cherries sounds like a wonderful flavour of ice cream! It looks quite spectacular! Intriguing, I do love cherry ice cream and I really love goats cheese; combining them is quite creative. We just won’t talk about the bleating. This looks so creamy and perfect!! I’m sure the tang and sweetness together is amazing. This looks so good. We actually were able to try goat’s milk ice cream last summer in London. Talk about amazing. And of course, I love goat cheese in just about everything. I’m sure it tastes spectacular in this creamy berry base! Thank you for sharing! oh my this looks very indulgent and rich!! Looks great. I’ll make this when I find local cherries. Too funny of a story. I love this idea for an ice cream. I haven’t made goat cheese or goat milk ice cream yet, but have been thinking about trying it. Cherries sound like a great compliment to its tang!